Take this Erickson folding cargo carrier along for camping, hauling wood, hunting or fishing. Able to fit 2 in. receivers, this black, rust-resistant cargo carrier holds up to 500 lbs. 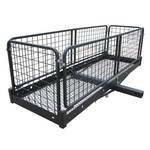 Its collapsible steel basket provides additional space while steadily securing your items. You can remove the fencing around the basket, and it also folds down neatly when it’s not in use.